Next month marks my two-year anniversary of becoming a Silpada Designs rep, representing fabulous .925 sterling silver jewelry! I’ve loved this line of jewelry for years and so when I took the plunge to sell it, it was an easy choice. I’m passionate about it – the design, materials and craftsmanship are simply the best out there. And the style is “hip/classic,” meaning on-trend but not trendy. I love seeing women in their 20s AND women in their 70s wearing the same jewelry, rocking them their own way and looking great! Stylish and chic. .925 sterling silver is the highest quality of sterling silver available – it’s the same grade of silver that Tiffany’s uses…but nowhere near Tiffany’s price points! Now, you may hear the term ‘.925 sterling silver’ and wonder…just what the heck does that MEAN? Well, here’s the answer: .925 sterling silver is an alloy (a mixture) of silver, copper and zinc. 92.5% of it is silver, and the remaining 7.5% is copper and zinc. Pure silver on its own is far too soft to be useful for anything like jewelry or silverware, so copper and zinc are added as strengthening agents. That’s it! And Silpada’s sterling silver is not plated, meaning it’s not coated in a thin layer on top of brass, for example. So you won’t have problems with it ‘wearing off’ over time. In fact, Silpada offers a lifetime guarantee on every piece of jewelry…with free postage for returns and exchanges! Now THAT’S even more reason I’m proud to represent this product – the company stands behind its jewelry 100%! There are other grades of silver out there that are mixed with other metals such as nickel. Silpada jewelry is absolutely nickel-free. I always mention this at my home shopping parties or when people ask me in general about the jewelry. Nickel is known to cause allergies and skin reactions in some people. Ever had a necklace or ring cause your skin to turn green? That’s likely a nickel allergy. It’s happened to me with other brands of earrings. Now, I have had customers show me where they’ve had skin irritations with Silpada jewelry, mostly on their fingers underneath their rings. The cause of this is not the sterling silver, but water and/or lotion getting trapped between the ring band and the skin. The skin turns pinkish rather than the green I’ve seen with nickel. The solution is to stop wearing the ring for a few days to allow the skin to heal. Then be sure to dry your hands completely after washing them, and dry your rings inside and out before putting them back on. And try not to put lotion where you wear your rings (admittedly this can be a little challenging). Speaking of water, I do not recommend bathing or showering in jewelry either. I do know of customers who do this with no problems (and I cringe as they tell me; hopefully my facial expression is enough to discourage doing that). Over time the residue from soap and shampoo can dull and mar the jewelry’s finish. And please, everyone, remove your bling before getting in a pool or hot tub! The chemicals in the water will react horribly with the sterling silver, leaving ugly, orange and brown rust-like splotches on it. I’ve seen lots of unfortunate-looking pictures of this in our Silpada Facebook group. I’ve been asked about the best ways to care for sterling silver jewelry, to keep it looking beautiful for a lifetime. Sterling silver does tarnish (darken) over time, and exposure to the open air speeds up this process a little. It’s actually the copper in the sterling silver alloy that causes this. Now note that the darkened (oxidized) look is sometimes part of the design of the jewelry itself to showcase its handcrafted textures and beauty, so a little oxidation is not always a ‘bad’ thing. I also find that pieces I wear a lot tend to pick up a little of the oils on my skin and just need occasional cleaning. Keeping your jewelry stored out of direct sunlight is the best way to slow down the tarnishing process. I don’t follow this rule 100% so I know I will need to spend a little more time and love caring for what I have to keep it looking its best. There are two ways I’ll share with you today. 1. Use a polishing cloth. Silpada’s polishing cloth is 8″ x 10″. It’s white and treated with a jeweler’s rouge to remove the tarnish from sterling silver and it comes in a resealable envelope. It also works great on your gold and platinum jewelry too! Did you know that Silpada donates $1 from every $5 cloth purchase to the Juvenile Diabetes Research Foundation, and has donated over $1 million since the launch of this program? Just this year at National Conference in Kansas City, Silpada presented JDRF with a check for $127,000! How long does a cloth last? The answer depends on how much jewelry you are polishing and how tarnished it is when you start. Typically my cloths last about 3-4 months, but your mileage may vary. It’s a great way to keep jewelry looking its best AND donate back to a great cause. 2. Another cheap and quick way to bring back the shine…a little baking soda, tin foil and boiling water! This is a great method if you have a lot of jewelry you want to get sparkling all at once. I’m going to start doing this the day before my home shopping parties to really make sure my display pieces are in tip-top shape. What a timesaver! 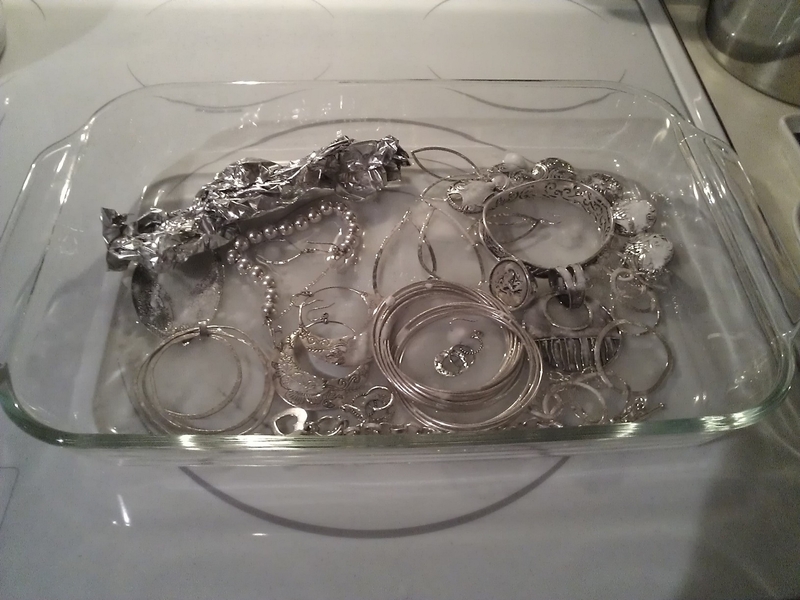 Find a Pyrex bowl or baking dish and place your jewelry in it. Grab some tin foil, and crumple it with your hands. Loosen the crumpled tin foil slightly and place it in the bowl or baking dish. Sprinkle a little baking soda lightly over the jewelry. Pour boiling water over the jewelry, enough to cover it completely. Let sit 20 minutes. Remove jewelry from the mixture, rinse it lightly and pat dry completely. The water will still be a little warm, so use caution at first when removing your jewelry. Above is a picture of the sparkle in progress! Note I do not have my burners turned on – I just placed my baking dish with the jewelry on it so it would be near the boiling water in the tea kettle. Don’t freak out about pouring boiling water onto your jewelry (I admit I did at first, but this method was recommended by a senior Silpada rep so I trusted it would work and not be harmful). Remember, the jewelry was crafted at far higher temperatures than 212 degrees F (100 degrees C)! And, ta daaaa…here’s my sparkling beauties! 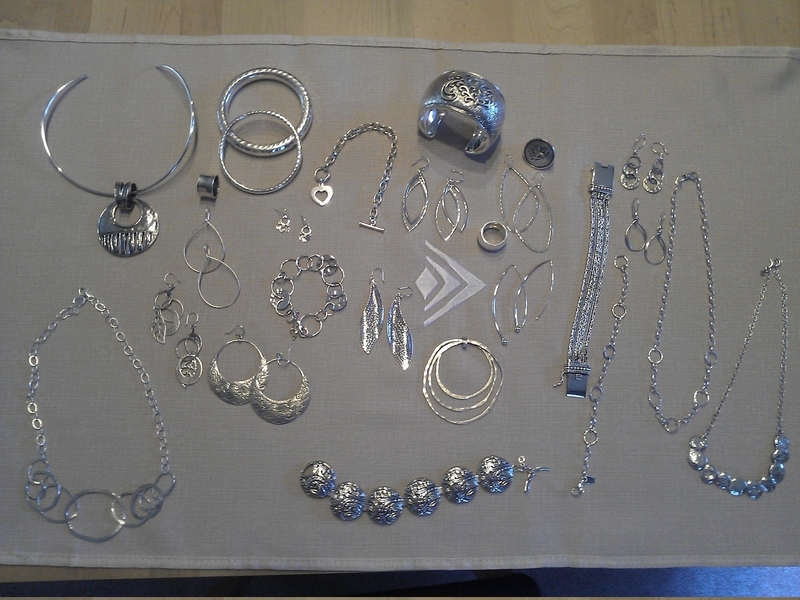 This is just a small sample of what I bring to jewelry parties…see why I have the ‘best part-time job in the world’? I get to wear my inventory wherever I go, get paid to party (I earn commission on every piece sold), and my hostess gets free jewelry credit depending on the amount of her party sales! All in a totally casual, no-pressure environment. I don’t have to do any sales pitches or memorize silly presentations for guests to have to sit through. Nope! We just eat, drink, socialize and play in the jewelry – that’s it! If you do want to try this method, please read this ‘fun fine print’ before starting. First, do NOT put any sterling silver jewelry in the baking soda bath that contains other materials such as pearls, diamonds, faceted glass, CZs or any other semi-precious stones. You risk harming the stones – I have no idea how baking soda would react with any other materials. Do not use this method for jewelry which has leather or cord as part of the design. Again, not sure how baking soda would react with it, and getting leather or cord wet in general weakens it. I also have not tried this with plated jewelry (jewelry which has a layer of sterling silver over another metal such as brass) so I’m not sure if it’s OK or not. Be sure to use a Pyrex glass bowl or baking dish. No metal bowls! Use Pyrex or another brand of glass that can handle boiling water without shattering. Do you know how to tell if a piece of jewelry is .925 sterling silver? It will have a “.925” stamp on it somewhere. It’s sometimes tiny and hard to find, but it’s there! Or try the magnet test – hold your jewelry next to a magnet and watch what happens. If it’s .925 sterling, it won’t stick! If it does, your jewelry contains other metals. If you have any questions about the cloth, the baking soda bath or the jewelry please feel free to post a comment or message me!